NASCAR Race Mom is not a Big Joey Logano Fan; but Must Give Credit Where Credit Is Due. This story brought a Tear to My Eye. 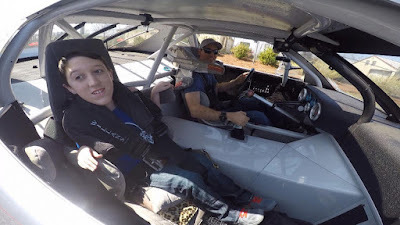 Hundreds of Make-A-Wish Foundation children have visited NASCAR tracks and drivers over the years. NASCAR drivers participate joyfully in this cause, one which grants wishes to children with life-threatening or chronic diseases. But few of the driver-child relationships develop like that of Ford Performance driver Joey Logano and Gavin Grubbs, a 14-year-old from Harrisburg, Arkansas. Grubbs, who has muscular dystrophy, was granted his wish – to attend the Daytona 500 – six years ago, and it came with a bonus. Grubbs met Logano, his favorite driver, and they have been close friends for the past six years. 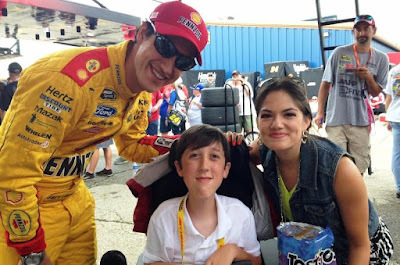 Logano was only 19 years old when he received the request to participate in Gavin’s wish. Logano readily accepted, and he made the occasion even more special for Gavin by making a surprise visit to Harrisburg. Logano flew into the small town Jan. 22, 2010 and surprised Gavin as the highlight of an event at Harrisburg High School. Gavin attended the Daytona 500 the next month, and the two have continued to stay in touch since then via phone calls, texting and visits. The relationship advanced to the point that Gavin served as a groomsman at Logano’s wedding. The Gavin-Logano story has been featured on CBS News’ 60 Minutes program, one of the most widely viewed hours on television. “Sometimes you meet people and you just instantly connect,” Logano said. “You have that feeling of being comfortable with someone. We just hit it off, and we’ve kept that relationship going over the years. Gavin said he chose Logano as his favorite driver because of his youth. This includes some friendly criticism of Logano’s race performances. Gavin is in a wheelchair, “but he’s a silver-linings-type person, and that’s what I want to be,” Logano said. “He’s been dealt a pretty tough hand, obviously, but he makes the most out of life. Mindy Grubbs, Gavin’s mother, said her son became attracted to NASCAR very early in life when he watched races with his father.